This article shows how to use Elasticsearch highlighting in a MVC application for search results. 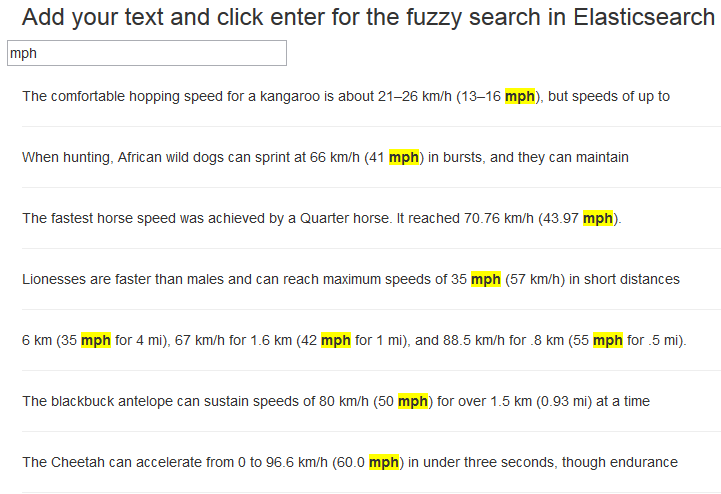 The application does a simple Elasticsearch Fuzzy Query and the highlighted results are displayed in a Razor view. Before the search with the highlighting request can be sent to Elasticsearch, an index needs to be created. The FastestAnimal class is used for this. The CreateIndexWithDataIfItDoesNotExist is added to the global application Startup method. This is called every time the web application is started in IIS. The method checks if the index does not already exists. If no index exists, a new index is created using the IndexCreate method. This creates per default a fastestanimals index and a fastestanimal type. This can be changed if required. Then some data is created and the index is filled with documents. The search method uses a Fuzzy Query to search for the data. The term is searched using the data field. The Highlight property is configured to highlight on the data field using custom pre and post tags. The class mycolor is used to style highlights. The method returns just the highlighted results. This could be changed to return the hit results as well or the Id so that a search link could be created. The MVC controller implements an action method which is called from the view. This method calls the search provider and returns the list as a Json array. The view sends an ajax form post request to the MVC controller using jQuery. And the results are then displayed with the required highlighting. Other search examples with highlighting can be found in the tests in ElasticsearchCRUD.